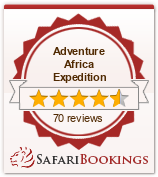 1: Please note that gorilla trekking is strenuous activity and some one should be fit to enjoy this safari. 2: Minimum trekking age is fifteen years. 4: Being in possession of gorilla permit is a guarantee of trekking and sighting the gorillas, the quality of the gorilla trekking cannot be guaranteed, minimum time allowed with the gorilla will not exceed 1 hour. That’s you are allowed only 1 hour with the gorilla.